The countdown has ended, and years of near-silence are coming to an end Wednesday as venture-backedBloom Energy unveils its much-anticipated fuel cell at a big media event at eBay offices in San Jose, Calif. The buzz around Bloom Energy has reached a fever pitch. It’s no wonder: The 8-year-old company represents Kleiner Perkins Caufield & Byers‘ very first cleantech investment, has raised somewhere around $400 million in funding and counts former U.S. Secretary of State Collin Powell as part of its board of directors. In a sneak peek on 60 Minutes earlier this week, founder K.R. Sridhar also revealed that 20 customers — including prominent companies such as Google (GOOG), Wal-Mart (WMT), eBay (EBAY), FedEx (FDX) and Staples (SPLS) — already have bought fuel cells, called Bloom Boxes, and are testing them in California. That last accomplishment alone is enough to put Bloom in a rare category among fuel-cell hopefuls. After all, only a handful — perhaps a dozen companies or fewer — have managed to get even a dozen commercial-scale fuel cells up and running on customer sites, says Neal Dikeman, a partner at merchant bank Jane Capital Partners. Still, many of the details that investors, customers and analysts really need to know to weigh the technology and the company’s prospects remain obscure. Among those details are the price per kilowatt-hour, the system efficiency, how much electricity the boxes actually produce, the maintenance they require and the cells’ reliability. Industry insiders were hoping that some of these questions would be answered at the launch, but the specifics remain a secret so far, although Sridhar claimed at the event that Bloom’s technology is affordable and twice as fuel efficient as conventional power plant technologies. “They might have something, but until they have third-party reported data, a spec sheet and something I can confirm the spec sheet with, I just don’t know,” Dikeman says. “It all boils down to the data, and they haven’t shown any data.” Until Bloom does this, such skepticism will remain because fuel-cell companies have a long history of failing to meet their potential. 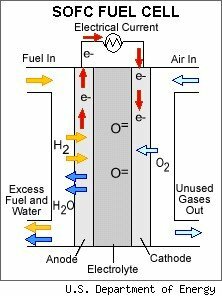 Fuel cells convert fuel and oxygen into electricity and water in an emission-free electrochemical reaction. A number of challenges, including technical difficulties and high costs, as well as infrastructure and policy gaps, have kept many promising fuel-cell technologies in the demonstration phase for decades. The idea behind Bloom is that customers — apparently corporations initially, but later residential customers and potentially even utilities — will be able to efficiently generate their own electricity from different types of fuel, including natural gas, landfill gas or biogas. The Bloom Boxes house solid-oxide fuel cells, which are made of ceramic materials and operate at high temperatures (around 1,830 degrees Fahrenheit, according to the U.S. Department of Energy), potentially reaching higher efficiencies than other types of cells. These specific fuel cells are made of a beach-sand-based ceramic tile coated with green and black ink, using a cheap metal alloy instead of the usual platinum catalyst, Sridhar told 60 Minutes. While he didn’t disclose the capacity of the current Bloom Boxes, The New York Times in 2008 reported plans for a five-kilowatt box, with the possibility of 100-kilowatt boxes in the future. To illustrate the advantages, Sridhar described a system of four Bloom Boxes running on natural gas that have powered a Google data center for the last 18 months. The system uses half as much natural gas as a conventional power plant would need to produce the same amount of electricity, he claims. Meanwhile, eBay says its five Bloom Boxes, installed nine months ago and running on biogas so that the electricity is carbon-neutral, already has saved it more than $100,000 in electricity costs. Of course, the price of the fuel is a significant factor in determining the energy savings. If most customers end up using natural gas and natural gas prices rise, they would have to wait longer to get a return on their investment, says Brian Yerger, CEO of consulting firm Aerca Advisors. “Unlike something like solar or wind or geothermal, where the energy source is free, you’re still beholden to the price of the fuel commodity” with this technology, he says. Also, the boxes don’t come cheap. They cost $700,000 to $800,000 each, according to 60 Minutes, although it’s unclear whether that’s before or after government incentives. Fuel-cell projects are eligible for a 20% state subsidy on top of a 30% federal tax break in California, for example. If the incentives bring the price down to $350,000 per box, eBay would see payback in approximately 13 years. On its newly launched site, Bloom Energy claims the typical customer would see payback in three to five years. In any case, Bloom Boxes haven’t yet been field tested for even three years, so industry insiders say it may be too soon to know for sure whether a Bloom Box would last long enough to deliver that payback. One of the biggest challenges with solid-oxide fuel cells has been their reliability because they often degrade over time, Dikeman says. According to the DOE’s Office of Energy Efficiency and Renewable Energy, the need for low-cost materials durable enough to withstand these cells’ high temperatures is “the key technical challenge” facing solid-oxide technology. Different materials expand at different rates when the temperature rises, and materials — or the seals between various materials — can crack as the cells cycle from cold to hot to cold, Dikeman explains. In addition, temperatures may vary in different parts of the cell, further complicating the issue. In early tests of solid-oxide fuel cells, most cells failed after only a few years, Dikeman says. “Earlier iterations sat there for a couple of years before people figured out there were fundamental flaws,” he says. Another challenge is that unlike solar panels, for example, which labs can expose to approximately the same amount of light they would see over 10 or 20 years in a much shorter time, Dikeman says, accelerated tests haven’t yet been developed for fuel cells. And while the solar industry has more than 30 years of data on solar-power systems in the field, that breadth of experience doesn’t yet exist for solid-oxide fuel cells. All that means it’s still too early in the testing to know how the fuel cells will stand up over time, Dikeman says. Nevertheless, many industry insiders aren’t ready to discount the allure of fuel cells yet. Their high efficiency of converting fuel to electricity, their lack of greenhouse-gas emissions, their ability to scale up and down well and their lack of moving parts — which could ultimately make them longer-lasting than conventional technologies — all make for an interesting proposition, Dikeman says. And solid-oxide fuel cells, specifically, could bring some major advantages. Their high temperatures mean they don’t need a precious-metal catalyst, they can use a variety of fuels and they can potentially convert fuel to electricity at efficiencies of 50% to 60% — all of which could significantly reduce their costs. Dikeman thinks it’s likely that Bloom has made some technological advances. “It seems like they’ve done a lot of neat stuff,” he adds, pointing to the cheap metal alloy catalyst, the ceramic material and the cheap coatings. Certainly no one can accuse Bloom of a lack of ambition. Sridhar wants to cut the price to less than $3,000 in five to 10 years, which some call an unrealistic goal, and eventually wants to see Bloom Boxes on homes everywhere, including in remote villages in Africa. But as Bloom prepares to escalate all the buzz into a roar, it clearly still has plenty left to prove.